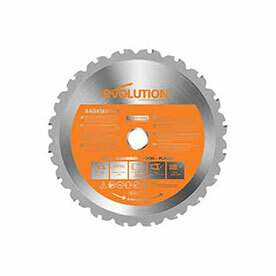 With a 1020mm track included this circular saw is hard to ignore. Power and precision at the forefront of its design, the R185CCSX ensures accuracy and reliability to get the job done faster, smoother and safer than ever before. True value for money with 3 years limited warranty. premium Japanese steel, tungsten carbide tipped. For accurate straight cuts every time. Accurate cutting with adjustable 64mm depth of cut - perfect for trench cutting. Powerful 1600W hi-torque motor with optimised gearbox & blade system. 0° - 45° bevel tilt with virtual pivot keeps the blade on the same cutting line at any angle when fixed to a track. Ergonomic, soft grip handles provide maximum control, versatility and precision. 1020mm Circular Saw Track included. Supplied in 3x pieces with connectors. Premium Japanese Tungsten-Carbide-Tipped (TCT) 185mm blade included. Will it cut thicker than 1/4” (6mm) mild steel plate? The arbor size of the R185CCSX is 20mm.